If you’re looking to market your business to people browsing on mobile devices, a new study from Adobe says tablets are where it’s at. According to Adobe’s new report, The State of Mobile Benchmark, in the last three years tablets have overtaken smartphones when it comes to web traffic. Internet users are viewing 70 per cent more pages when browsing on their tablets compared to their smartphones, behaving much more like they would behave when using a PC. Not much Canadian data was broken out of the global report, but when it comes to mobile browsing traffic share by country, Canada does well. According to the data, 8.7 per cent of Canadian web traffic comes from tablets, and 6.8 per cent from smartphones. 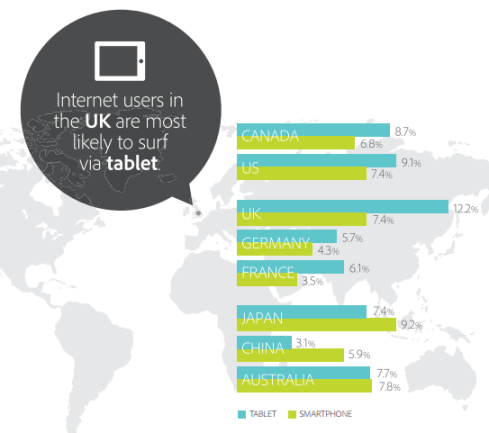 That’s in line with the U.S. figures, although the UK leads with 12.2 per cent of its browsing traffic coming from tablets. Interestingly, in Asia, smartphones remain the mobile browser of choice. The decision on what device to browse isn’t just about device preference, though. It’s also influenced by where they’re browsing to. For shopping on retail and e-commerce sites, tablets get the nod, while smartphones are favoured when visiting telecom and media/entertainment sites. Digging a little deeper, the report found that iOS and Android account for nearly 90 per cent of all smartphone traffic in their global sample. RIM’s strongest remaining footholds are in the UK and China (Canada was not measured in this category). Marketers will want to plan their app and web site development accordingly. When smartphones are measured by manufacturer, Apple and Samsung gained more than 10 per cent market share over the last year, while all other remained stagnant or declined. 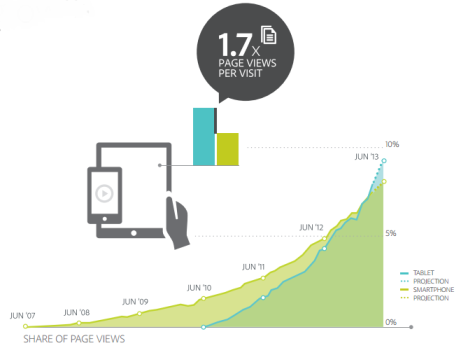 And when it comes to tablets, Apple’s iOS was dominant with 77 per cent of traffic.